It’s hard to predict the future. One good indicator of what will be lies in examining the past. This is because history has a tendency to repeat itself, probably because we, humans, like to stick to familiar patterns and tend to gravitate towards what we know, or what we used to know. So what lies ahead for us, DJs? Over the last 10 years or so, physical user interfaces have evolved from using buttons & knobs towards touch-enabled screens. Take the two examples below. The one of the left is the dashboard of the 2003-2010 Audi A8, full of knobs & buttons, the one on the right is the dashboard of the 2018 Audi A8: 3 big touchscreens with haptic touch technology for control over all car functions. 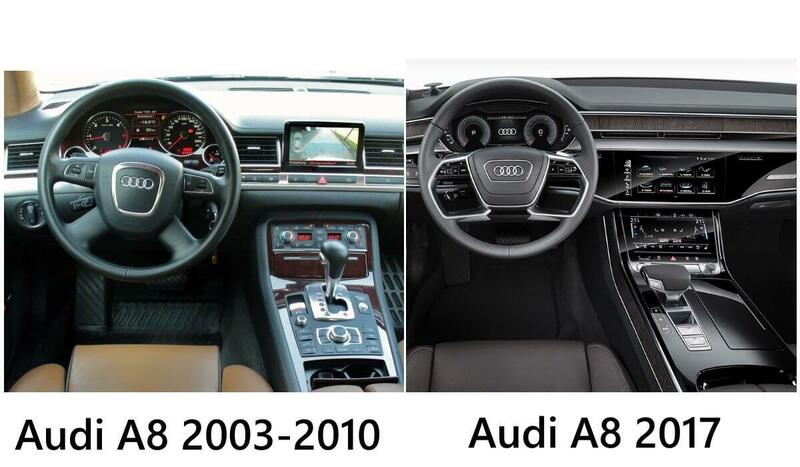 Audi A8 generations compared: less buttons, more touchscreens! 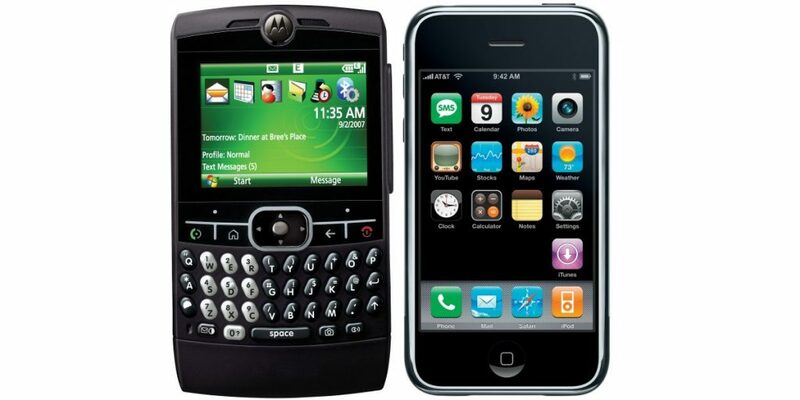 Phones have seen the same type of evolution, starting with the launch of the first iPhone. Touch screens make it much easier for manufacturers to add or improve existing functionality since these are not restricted by the hard-wired functions & labels of physical buttons & knobs. The interface is cleaner and easier to maintain, and the risk of having buttons or knobs break or stop working is eliminated. So it’s safe to say that the future of consumer electronics is touch. But if that is true, will this be the future of DJ equipment as well? In the last years, we have seen touch screens invade the DJ gear market. 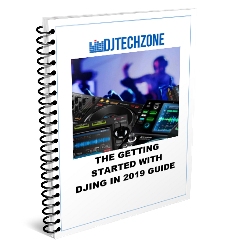 Many manufacturers such as Pioneer DJ, Native Instruments, Numark & Denon DJ have integrated (touch) screens into their DJ gear products. 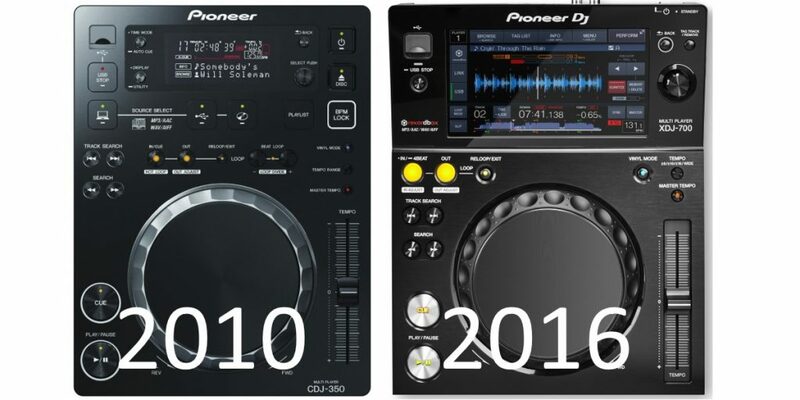 A good example here is the evolution of the CDJ / XDJ line from Pioneer DJ. When comparing the two, the screen on the XDJ-700 is far superior to the one on the CDJ-350. It’s a full color, high-resolution touchscreen and many buttons have been removed and integrated into the touchscreen interface. Note the price point is more or less the same, around USD 600. That being said, the jog wheel, pitch fader, cue, play, loop & browsing buttons are very much unchanged. Could it be that some functionalities are just too hard to transfer to a touch interface, and will remain physical forever? Or are DJ gear manufacturers just very traditional and much less open to innovation? Wait a second. Touch-enabled djing exists for years. 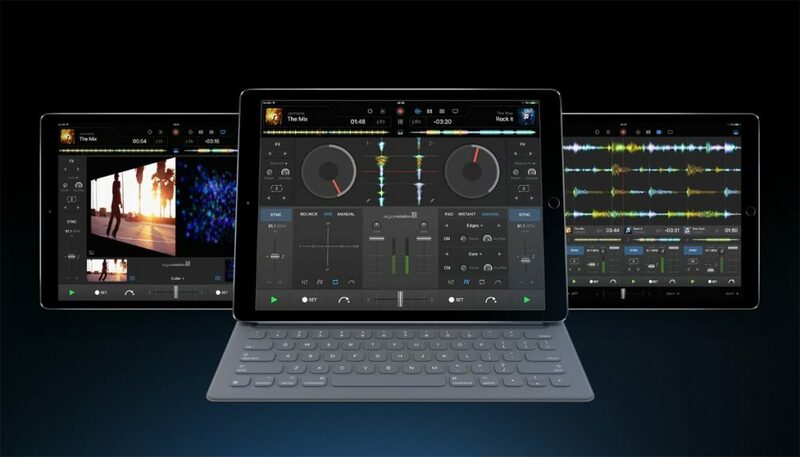 Algoriddim’s djay pro, Traktor DJ and now Pioneers DJ WeDJ: all these apps are meant for a tablet or phone, and if you use them on a big tablet, they start to feel really robust and usable even in demanding settings. But for me, these are not really touch solutions. Most of these apps are marketed together with physical DJ controllers, and their potential is only realized when connected to one. So in the end, the iPad is not much more than a computer screen interface for a dj controller setup. 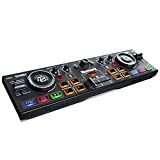 My gut feeling tells me that DJ gear manufactures will go fully touch once they find a way of making the touch screen an essential part of the workflow. 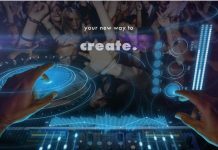 In other words, they need a “killer app” for touch that opens radically new possibilities for DJs, something that can never be achieved with traditional faders, knobs, buttons, and jog wheels. For that to happen, we really need to move beyond emulating what already exists and fully embrace the possibilities of touch technology. We need to achieve a solution in which the screen is the djing interface, and not only there to display information. And there are manufacturers that are developing these touchscreen only interfaces today. It’s pretty clear that this technology will evolve in the coming years, and become faster, more responsive and more comfortable to use. You can see in the video that the responsiveness can still be improved, but my main critique of this solution is that they emulate existing technology. This is a good start, but to truly be a breakthrough, they will need to innovate and do something with that screen that no other DJ gear manufacturer can do. Djing is a precise art, and mixing tracks requires restraint and subtilty when manipulating faders, EQ effect knobs. 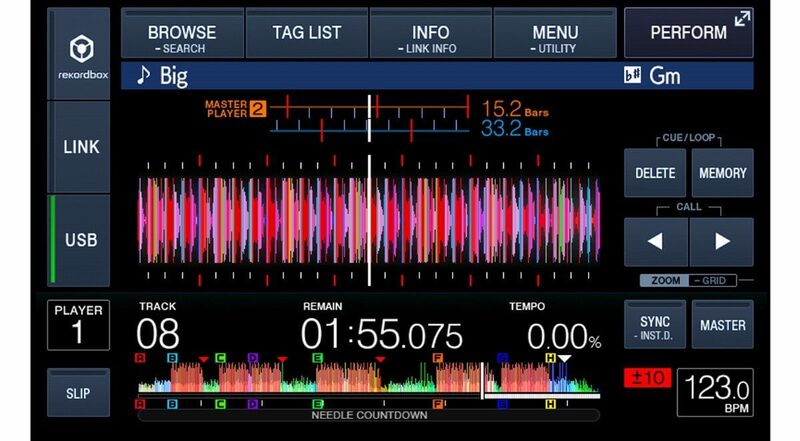 In the video above you can already see the rather crude response of the interface to the movements of the DJ, and it is in this area that touch interfaces need a drastic upgrade in order to “feel” right for DJs. Companies are already working on ways of delivering physical feedback in touchscreens, this article explains it well what we can expect in the future. So what needs to happen to push touch screens into the DJ gear mainstream? If these conditions are met, we might see a serious shift towards touch. A few months back I wrote a piece on Magic Leap and their augmented reality technology. The thing about Magic Leap is that their technology remains a mystery for now (there are rumors of them unveiling their technology at CES 2017) but it promises to be the next-gen in augmented reality, so well done that distinguishing between what is real and what is artificial will start to become difficult. What would that mean for djing? To be honest, it’s too soon to tell, but the thought of djing with augmented reality generated gear certainly opens up creative options that are simply impossible with current solutions. It’s hard to predict the future, but it’s not hard to predict future trends based on current developments. And to me, it’s pretty clear we will be moving away from physical controls to touch screens or even augmented reality. You might notice I don’t mention virtual reality, and I do that for a good reason. To me, virtual reality is the tech that “almost got there” but never actually made it. I know there are many manufacturers investing heavily in it the last few years, but I don’t think it will ever reach mass adoption. It was needed to reach the next step, and that next is augmented reality. 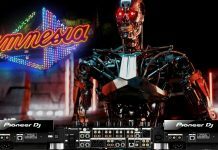 Finally, in this post I only focus on the interface, there is much more to say about future DJ gear. Will it continue to be depended on local computers and local storage solutions such as hard disks or USB sticks or will we all DJ from the cloud? Will music production and djing melt into 1 so that playing and creating music become (almost) interchangeable things? So many questions are open, and I’ll be exploring possible answers in future posts. What do you think the future of djing will be? Do you agree we will probably move away from physical knobs and buttons? Comment below! Is There A Future For DJ Controllers And Digital DJing? Is This The Future Of Djing, Amongst Many Other Things?